Andy opened his eyes, sat up halfway and noted the orange and pink colors in the sky and silhouette of the mountains. It was too light to be 5:15am. He checked his phone – 5:29. He glanced over at Laurie who was sound asleep. He stroked her cheek and asked if the alarm had gone off. She had no recollection but must have turned it off and fallen back asleep. We had a long day ahead of us and wanted an early start. We were tired of getting to camp just after others and losing out on our planned tentsites. So although we were already a little behind schedule we moved quickly and stepped on the trail at 6:15 am. We switchbacked down 1500 feet to the Waptus River. The trail was over grown in some places and well maintained in others. We occasionally stubbed our toe or tripped over roots as we walked. This was all forgiven because we ate lots of thimble berries along the way. Seedy but delicious! Just after Spade creek, another nice creek seven tenths of a mile north of Waptus Creek, we caught up with Colleen and Diane. They had had another late night and were trying to get an early start to allow for a more leisurely day. We hiked together, chatting about our previous day. Laurie introduced them to huckleberries and soon after we were all stopped, picking and devouring the delicious berries. The trail started to climb but luckily we were still in the shade. We switchbacked up and up, walking across dry stream beds in the sun and back into the shade of the trees. This continued for another 7.5 miles. In total we climbed 2500 feet. 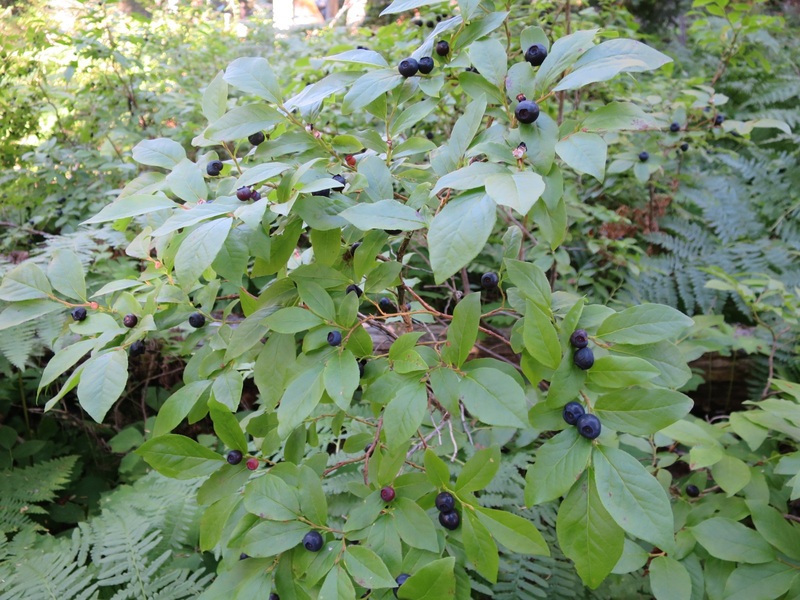 Andy noticed some large ripe huckleberries and after trying one he proclaimed they were the best he had had. A statement like that required further investigtion. Soon we were both sans packs with Talentis in hand. 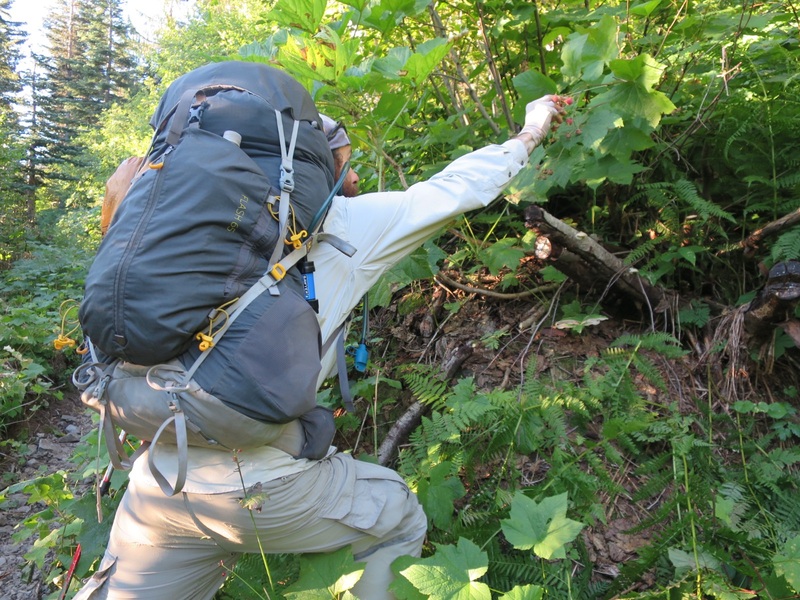 We picked until we had 1.5 Talentis worth and a plan to have oatmeal and huckleberries at the top of the hill. As we were picking we heard a loud noise. It sounded like stomping, but from a creature larger and heavier than a human. We heard 4 steps, then nothing. We stopped and stared at one another. We started talking loudly and looked in the direction that the noise had come from. We were in a delicious berry patch after all and wouldn’t have been surprised if we had a bear visitor. But we saw nothing and never heard the noise again. We stuffed the Talentis inside Laurie’s pack and hiked on. 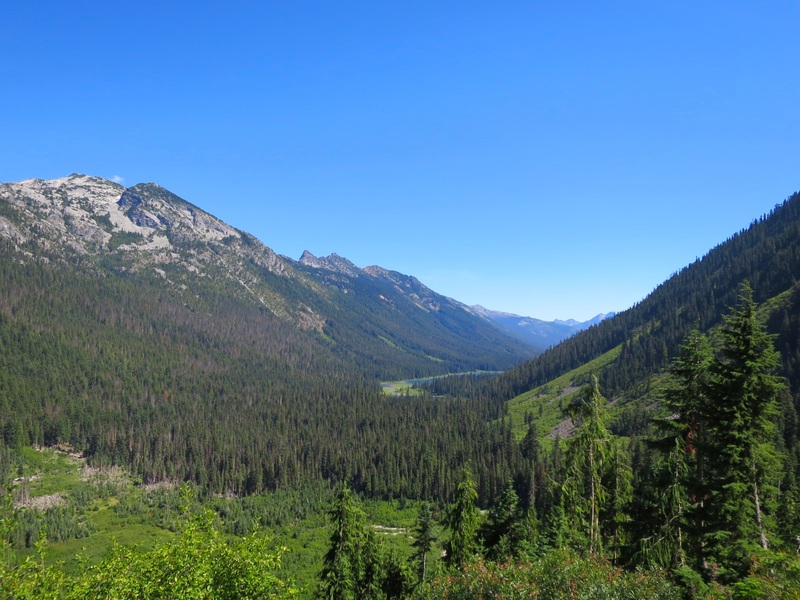 The switchbacks continued and we were drenched in sweat by the time we got to Deep Lake. 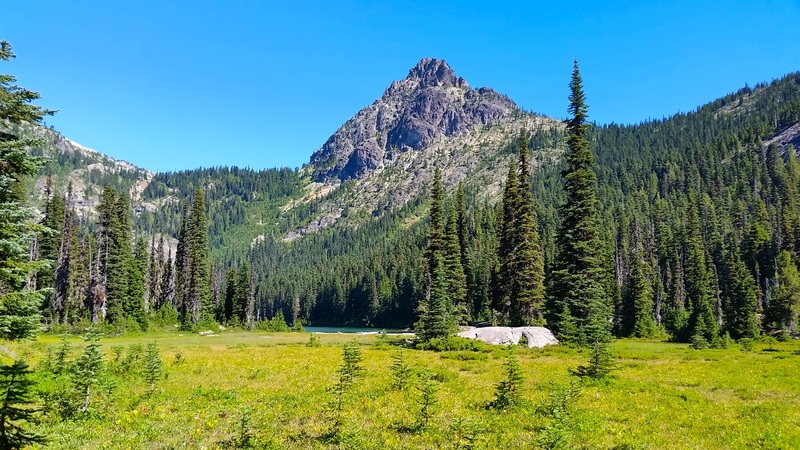 The lake looked magnificent – teal glowing against the talus and green meadows. Laurie resisted the urge to swim as we still had a pass to climb. We hopped across the lake outlet on a series of rocks and logs and continued up. It was around noon when we finally reached the junction to Peggy Pond. We found a shady spot and sat down in the middle of the trail. We had warm oatmeal with fresh huckleberries as we stared down at Deep Lake and the mountains and waterfalls across from us. It was an awesome spot for a break. Laurie took off her shirt and set it in the sun to dry. When she put it back on 45 minutes later it was stiff from the salty sweat. It quickly softened against her body as we hiked down another 2000 feet. We are in Washington and this is what the trail is known for – big ups and downs all.day.long. 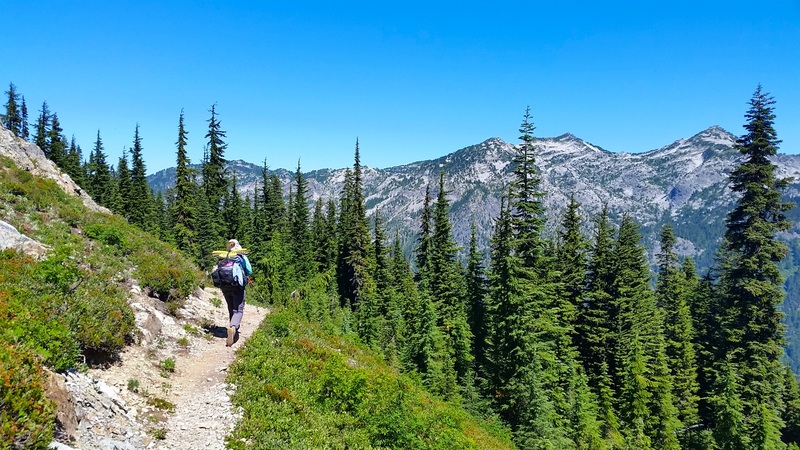 We met a lot of people who were hiking from Stevens Pass to Snoqualmie Pass. This seems to be the most popular section in the state, probably because it is beautiful and close to Seattle. One section hiker said he was taking a pole and wanted to know who we were voting for – Clinton or Trump. We get asked all types of questions! The trail switchbacked down through the trees. 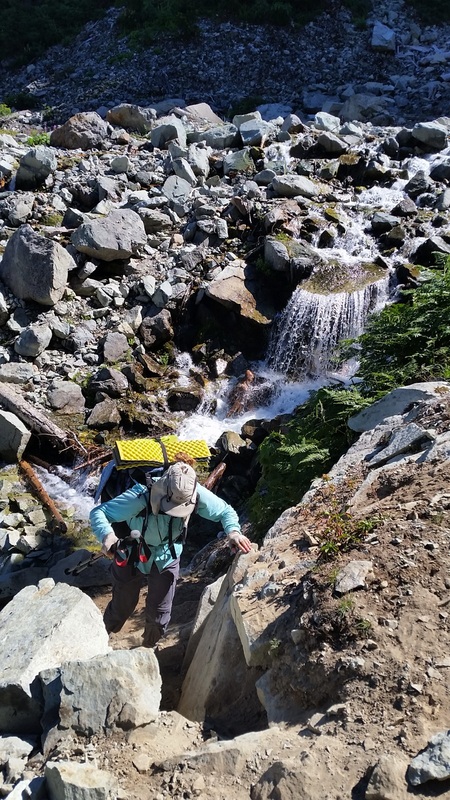 We passed many small creeks offering opportunities to wet our hats and allow cold water to drop down our backs. 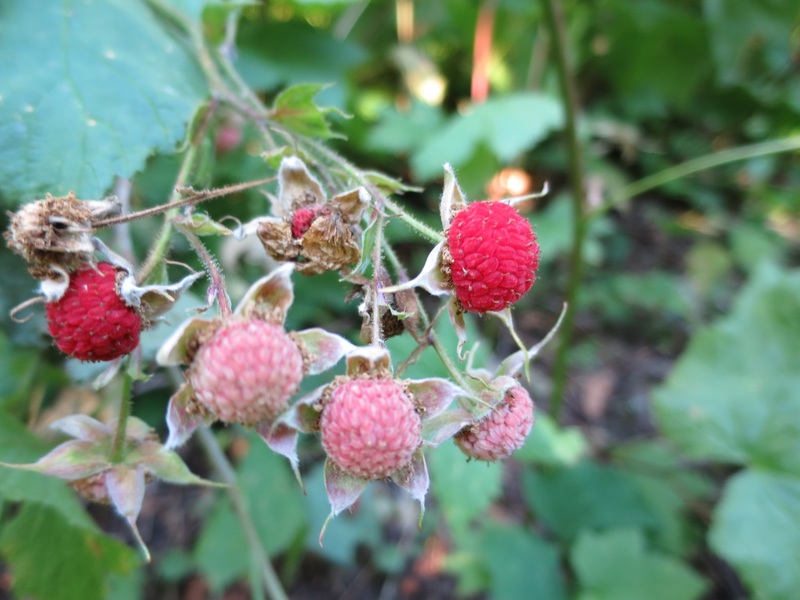 We walked past broad green thimbleberry leaves and prickly small salmon berry plants. We ate as we walked, munching on the local cuisine. We turned a corner and saw a large creek careening down a gully. 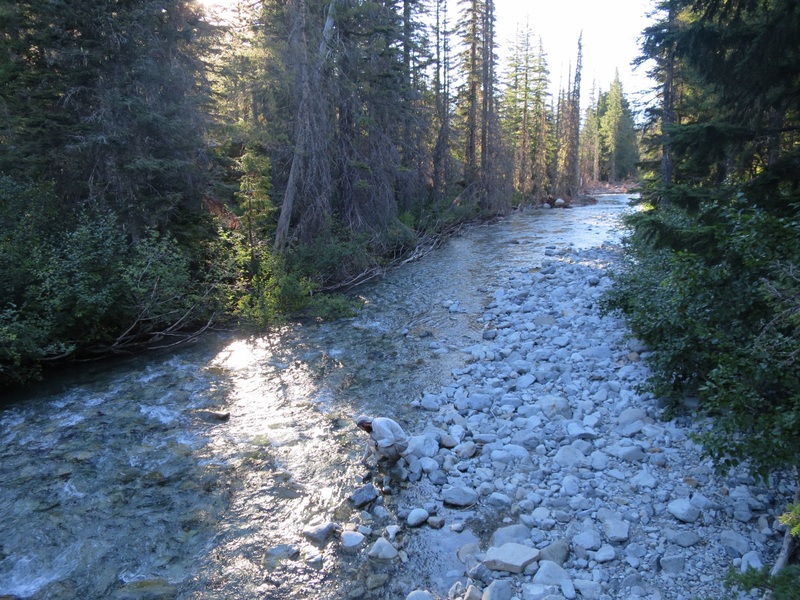 The creek bed was rocky and much wider than the creek itself at this time of year. The maps indicated that this can be a difficult ford, particularly in the early season. Luckily we are not in the early season but the sound of the water still made Laurie’s heart rate quicken. Apparently she still has some fear associated with creek crossings. Many people had passed us and none of them had mentioned a tough crossing, nor did their feet look wet. As we got closer it was obvious where to cross. Logs had been clustered together to form a bridge over part of the creek and we were able to rock hop the rest. 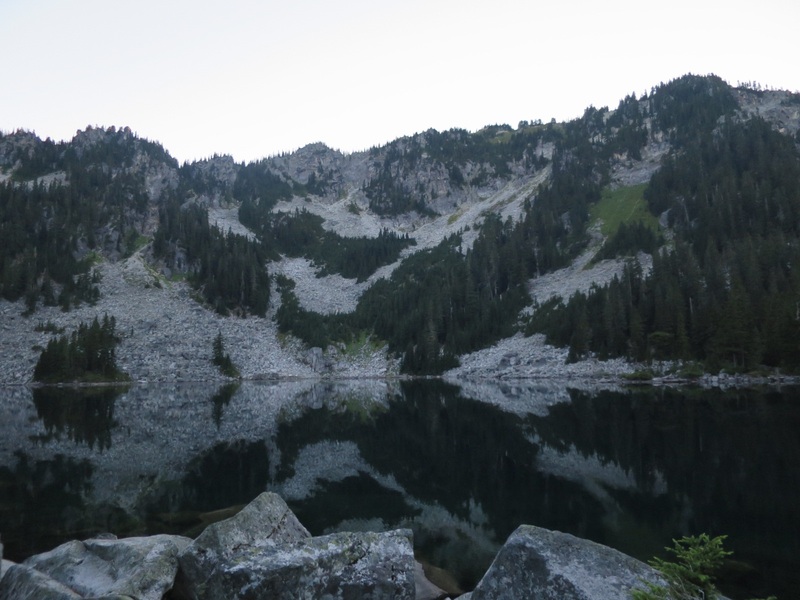 We walked on, past Deception Lake and up toward Piper Pass. It was late in the afternoon and the sun was intense. Laurie felt great and powered up the hill. Andy was dragging but stayed less than a switchback behind. We got to the top before 6 pm and descended the final 2 miles to camp. We switchbacked through a boulder field and down toward Glacier Lake. We were reluctant to camp at the lake in fear of too many people. Our concerns were valid once again. People were camped at our planned spot when we turned the corner at 7 pm. No real surprise to be honest. 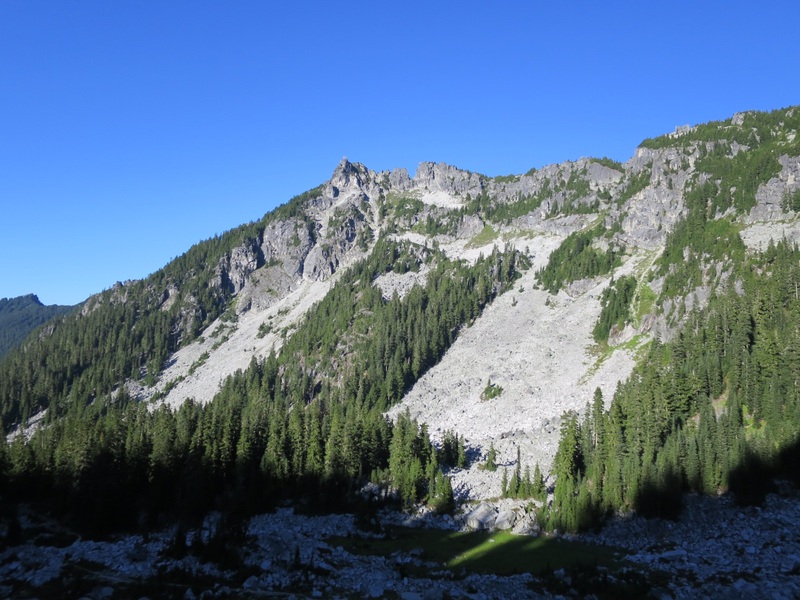 It’s close to Stevens Pass and a destination, two things a thru hiker should avoid when getting to camp late. Having said that, we were still hopeful and took the use trail to the campsites anyway. We managed to squeeze into a slanted spot very close to another woman’s tent at Glacier Lake. Thanks for sharing your spot with us Janet! Laurie asked where she was headed and when she learned we were thru hikers her eyes lit up. Seeing people’s reactions helps us see and remember the significance of what we are doing. Day to day it feels just like a backpacking trip. 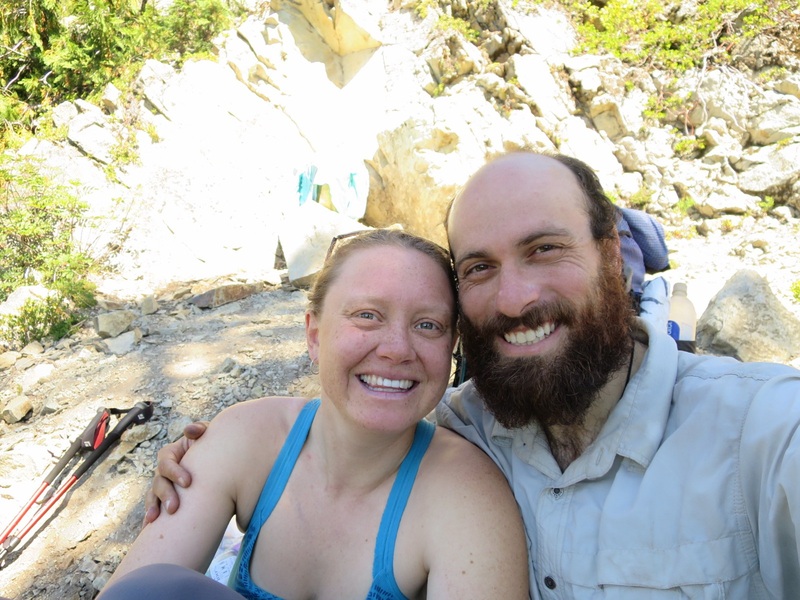 We think of this entire 2650 mile journey as a string of short 4-5 day backpacking trips. The best part is that at the end of a backpacking trip we get to go on another one! We ate dinner sitting on a rock watching fish jump on the lake. Now we lay in the tent staring up at the stars past the tops of tall trees. Tonight we are grateful for our trekking poles and manageable fords. Love to you both and I look forward to meeting you, Andy!! Thanks Felicia! Thanks for following along with us. The support we have felt through this blog has helped tremendously through the tough sections. We look forward to seeing you at some point soon- maybe the harvest party! Love you too! Congratulations to you both on your engagement! Wonderful news and pictures and thank you for sharing them. Yikes, you’re getting close to Wenatchee! Do you need a break? Welcome to rest here if you want. Congratulations on your engagement – after this trip, you know each other well! What’s up? Missing your postings. Wondering about fires. And your mom.